On a spectacular fall day, we had the opportunity to wander and explore the grounds of Heronswood Nursery&#x27;s gardens on the Olympic Peninsula in Washington. The Garden Conservancy is a wonderful resource for many things; but my favorite activity is their Open Days programs (click here to learn more), which gives you access to some of the United States' greatest private gardens. This weekend, the Open Days program sponsored a day at the past home of Dan Hinkley and original location of Heronswood Nursery. From the parking field in front of the nursery retail center, you enter the gardens through a series of connected paths through the forest. Here, you'll find a treasure trove of rare and unusual plants and trees carefully collected from all over the world. Garden statuary and columns that harkens back to an ancient ruin create a whimsical, magical mood as you wind your way through banana trees, magnolia, bogs and stepping-stones. Much of the garden art is the work of Little & Lewis, who work out of their studio and garden on Bainbridge Island. As you emerge from the forest, the sky opens up and you find yourself at the main residence on the property. One of the most striking features next to the house is the formal bog and hedge garden. Consisting of two rooms, it feels like a medieval courtyard. The symmetry and meticulous clipping of the hedges are just marvelous. In case you want to try your hand at this, the topiary is Carpinus betulus 'fastigiata' which gradually acquires a tear-drop shape as it ages. My favorite part of the garden has to be the formal, semi-tropical vegetable garden. The raised beds are laid out in a diamond within a square layout, all edged with a perfectly trimmed boxwood hedge. A wonderful mix of vegetables, sun flowers and nasturtiums create a warm, sunny feel to this autumn harvest. I could have lingered here for hours, sipping wine, tending to weeds, harvesting vegetables and flowers; or, curled up on one of the teak benches with a great book! As you follow the garden around the main residence, you find an entrance to the arbor, which arcs its way around from East to West. Off of the arbor are more stone pathways with loaded perennial beds and specimen trees. A quiet square fountain marks the center pathway from the arbor to the lawn. And at the West end of the Arbor, you find yourself at the beginning of the Perennial Quad, where you'll discover even more delightful, rare plants. There is so much to see, experience and learn from this amazing private garden. The catalog and business of Heronswood can be seen here; visit them online here. And, Dan continues his plant adventures, which you can read about here. WOW!!! I&#x27;m at a loss for words...absolutely gorgeous! 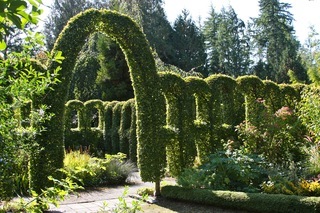 I like the idea of the boxwood hedges bordering a veg garden...never would have thought of that!!! Wow! What a gorgeous place! I want a hedge garden! If only I had the room. The fern walk looks so magical. (Tree ferns are my weakness.) And the arbor photos are so beautiful! Too bad this place is at the other side of the world. I&#x27;d love to visit!